These ones are made of thick, rough and scratchy Briggs and Little Tuffy (and I think they chose the name wisely! LOL!). It knits up very fast because of the size/thickness of the yarn and having fewer stitches around the socks, but it makes my hands hurt, so I can't work on the socks for more than a half hour at a time, then I take a break. Lexa suggested bamboo needles might help, but I haven't made my way to the store to get a set. Soon! I am currently working on a second pair. These are Greystone (which is actually a blue-green), with stripes on the cuff in Ecru, Cocoa and Greystone. 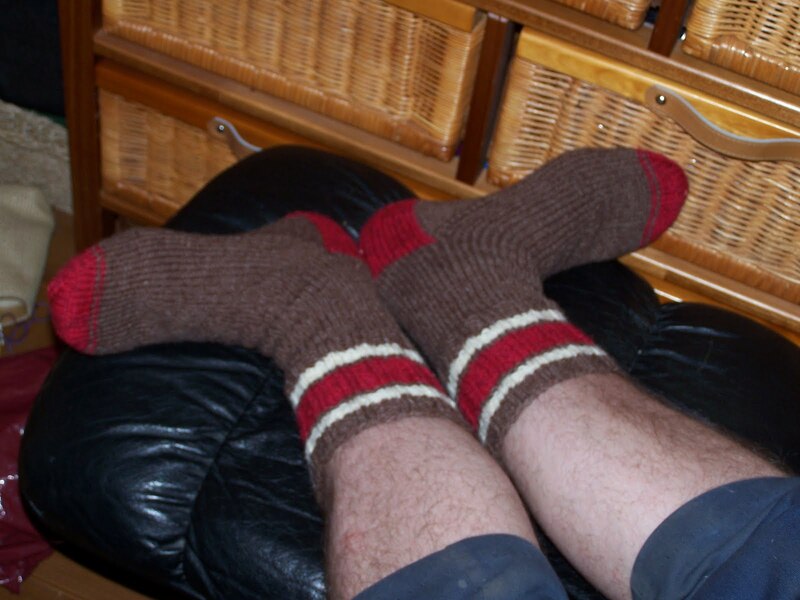 I feel your pain about knitting socks for me with large feet! 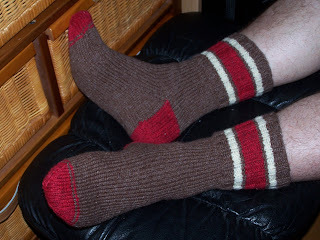 I always use bamboo or wood needles for socks - i just find my stitches don't fall off as easily. I just finished a pair of tuffy socks - got to get myself some bigger bamboo needles before I do any more knitting with that.